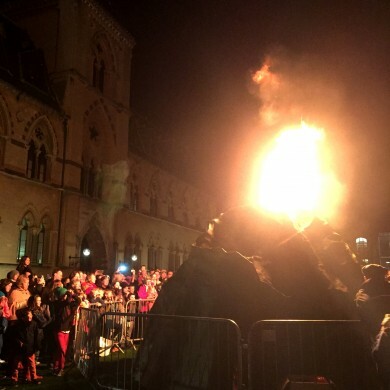 Half term saw a rather explosive event on the front lawn of the Oxford University Museum of Natural History, to mark two weeks of ‘Undergroundology’ events hosted at the Museum. Built as the centrepiece of Universities UK Week last year, the London Volcano is a scale model of Soufriere in St Vincent. Professors David Pyle and Tamsin Mather, and their colleague Professor Jenni Barclay at University of East Anglia have been studying the volcano as part of the STREVA collaboration (Strengthening Resilience in Volcanic Areas) funded by the Natural Environment Research Council. The Museum hosted three school study days aimed at primary, GCSE and A-Level audiences, allowing students to explore volcanoes from a number of different angles, including how they erupt, the explosive products, and the implications for those who live in volcanic regions. During half term, these themes were then brought to life for families outside on the lawn, as well as inside: with Top Trumps to play, volcano poems, a miniature ‘Volcano Observatory’ and table-top eruptions. The climax of the event was a night-time eruption of the Volcano. With readings from contemporary accounts of the 1902 eruption of Soufriere, recounting the terrible devastation suffered, 300 or so visitors were able to reflect on the very real impact of living in areas of volcanic risk, before witnessing a dazzling display of smoke, gas and flames.